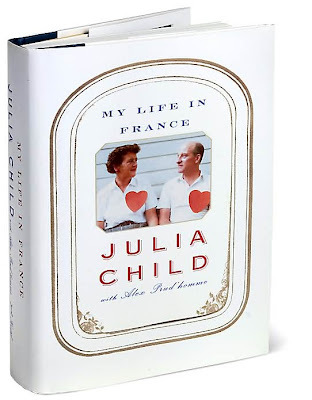 I finally bought Julia Child’s memoir which has been at the top of my list since reading Judith Jones’ (Julia’s editor for all of her cookbooks) memoir earlier this year. p.s. -- an initial peruse of the book revealed that the cover photo is actually homemade valentine that Julia and Paul sent out to all their friends….one of their traditions. Lovely, no? oh! i've been wanting to read this, too! This is one of my favorite books! I think you will love it! You will love book! I read this last summer. Another great book (if you haven't already read it) is Animal, Vegetable, Miracle by Barbara Kingsolver. It's about her family's journey to only eat locally and seasonally for one year. It was the the most eye-opening read for me about the food we eat. I am reading that book for book club this month and I've read about 30 pages and it's delightful! Oh, of course you will love this book. I read it a few months ago and so enjoyed it. Just a reminder of how much one can accomplish when they uncover their true passion in life. So inspirational. P.S. so excited for your new blog. you will love this book! i read it last summer and fell in love with Julia and her husband. and the julie/julia moving that's coming out is based partially on it too! Happy for you and your new blog! I'm right there with you 100% on your food philosophy. Actually, I think we're living parallel lives, I'm just trying to catch up to you. You are just the coolest. Oh, please let us know whether you liked the book! I've been eying it for awhile now! Can't wait to break it open! p.s. love that you are starting a new blog! i loved this book! julia child used to live in cambridge, and i once saw her at the grocery store. perhaps my only celebrity sighting. hope you enjoy the book...it's truly delightful! I loved this book! I wish you'd told me, I would have just sent it to you so you didn't have to buy now... I'm all about sharing books. oooh, would love to read this book before summer's end...please let us know how it is! such a wonderful read - if you haven't yet be sure to pick up Julie and Julia before the movie comes out. Too great! Have not read this book, but by far the best book I've read lately is American Wife. It's a great story. You should definitely check it out. I bought this book a while back and am hoping to read it this summer! Can't wait to hear what you think!